Pictured, American traveller, Jeff Swedenhjelm who was left paralyzed after falling 30ft from a roof after giving chase to a monkey who stole his Steelers cap. Image via GoFundme. 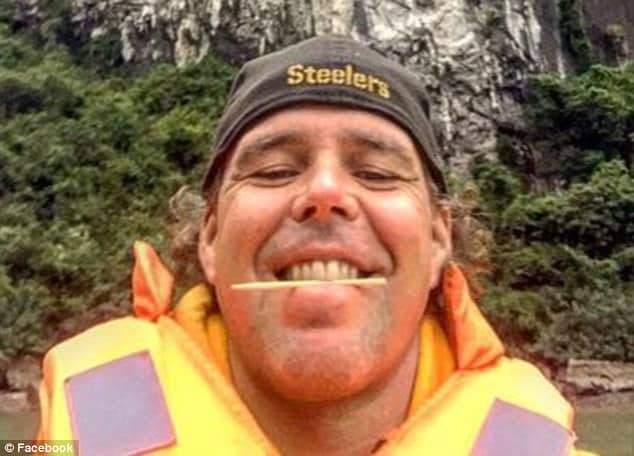 Jeff Swedenhjelm an American working in Bali, Indonesia is left paralyzed after falling 33ft giving chase to a monkey who stole his favorite Steelers’ hat. How much is your favorite team’s hat worth? 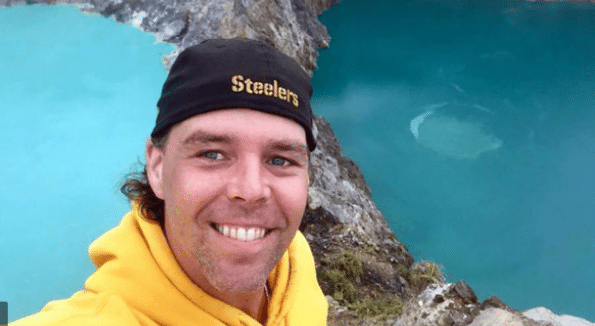 That might be a question friends and family might be asking after Florida man, Jeff Swedenhjelm was left paralyzed after falling 30ft after giving chase to a monkey who stole his ‘favorite’ Pittsburgh Steelers hat whilst traveling in Indonesia. Local reports told of Jeff ‘Swede’ Swedenhjelm, 40, plunging through a 33 foot-high roof in Uluwatu on the island of Bali while chasing the cap-snatching primate on Monday. 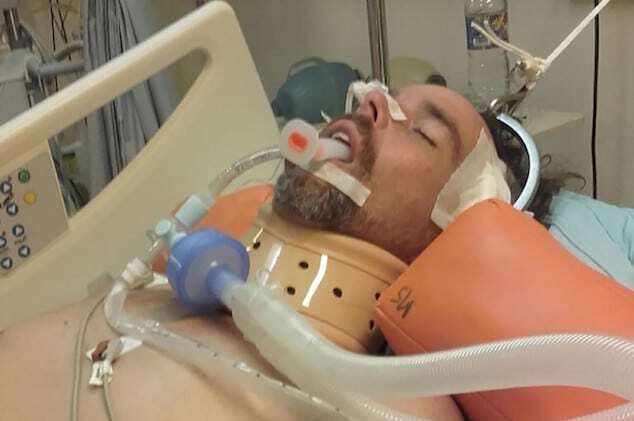 The incident has left the Bali based American expatriate paralyzed from the chest down and in a medically induced coma and battling pneumonia that resulted as a complication of his paralysis reported the Northwest Florida Daily News. 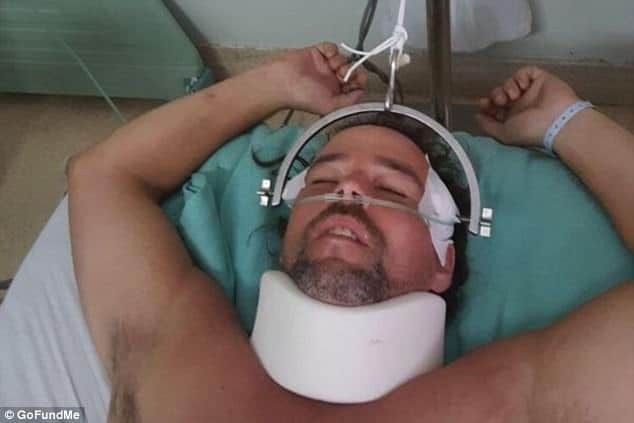 Swedenhjelm’s family is now pleading for donations to get him out of Bali and into the hands of a surgeon capable of fixing his severely damaged spinal cord. As of Sunday afternoon, over $58,000 had been donated. Family estimate that Swedenhjelm’s medical and rehabilitation expenses will total $100,000. Pictured, Jeff “Swede” Swedenhjelm, seen wearing his Steelers cap. Jeff Swedenhjelm: it could more than a year to get the expat walking again family say. The family’s most immediate hope is to collect the $60,000 necessary to get Swedenhjelm flown via helicopter to a spinal surgeon in Taiwan, Singapore or Malaysia. ‘Time is of the essence here as we are advised the longer we leave it the less likely he is to recover or even walk again,’ the family posted. Swedenhjelm, who is from the Florida town Destin, had been working in Bali over the last several years, his daughter Lyric Swedenhjelm, 21, told the Northwest Florida Daily News. It could take up to three months for Swedenhjelm to regain movement in his extremities and more than a year to walk again, according to the fund-raising page.